Congrats to the new Channel Islands Neighborhood Council! Thanks to all who attended the kick off of the new Channel Islands Neighborhood Council! And thanks to all of the newly elected! Please join us in the formation of the Channel Islands Neighborhood Council #10. The City has 33 active councils and our united voice is missing at the City. 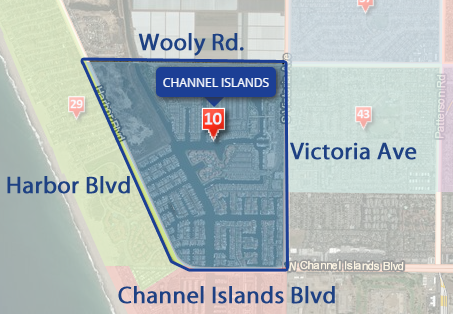 If you live within the boundaries: Wooley Rd., Harbor Blvd., Channel Islands Blvd., and Victoria then YOU are in NC #10. Please come to the first meeting and hear from our Police Department guest speaker: Senior Officer Mike McManama. An election will be held at this formation meeting and we need YOU! Unified, we will have a larger voice than any single HOA in matters where the City needs to act, protect our property, support our infrastructure, update our common areas and enforce ordinances and laws. Elected officials: Our Mayor, City Council, County Supervisor and a wide array of City Staff all recognize the value that Neighborhood Councils bring to the community. If you want more information you can leave a comment and we will connect you to Audrey Keller who has been setting this important meeting up with the City! All comments are moderated – if you want to be contacted I will not publish your comments – I will just pass that on to Audrey. The neighborhood councils serve as an outlet for Oxnard residents to work together to improve the quality of life in Oxnard by making each of their neighborhoods a cleaner, safer, better place to live. There are 43 pre-defined neighborhoods in Oxnard. Currently, there are a total of 33 active neighborhood councils. The City of Oxnard’s goal is for all neighborhoods to have an active neighborhood council. Neighborhood councils are open to all Oxnard residents ages 18 and older. Participants coordinate at the neighborhood level. Residents in pre-defined neighborhoods are responsible for establishing neighborhood councils and electing a chairperson to represent their neighborhood at the Inter-Neighborhood Council Organization forum. Residents in many neighborhoods are saying NO to graffiti, crime and trash by participating in neighborhood patrols. At the same time, residents are saying YES to working with the City to perform neighborhood cleanups, spearhead beautification projects and address code compliance issues. The collaborative efforts of neighborhood councils and the City have decreased crime and graffiti, removed blight and decay and improved the appearance of our City.